For most of the short lifetime of the crypto industry, governance has been either something interesting to wax philosophic about or a lever for fundraising with highfalutin promises. In this context, the dominant conversations in the crypto community have tended to be focused on other issues of more perceived importance. Part of this historic under-focus on governance systems may be due to the fact that governance concerns are perceived to be about the future. To think about governance processes before they need to be deployed requires a layer of abstraction that can seem distracting in the face of more immediate concerns. What’s more, open source protocols come with a certain “governance-by-default”: if you don’t like the direction, you can choose not to run the latest software or even fork away entirely. This way of thinking creates a challenge, however. Governance is, fundamentally, a rules engine that dictates how a protocol can evolve and adapt to changing circumstances. This sort of rules engine is extremely hard to add in later and impose upon a community once it has a set of functioning social norms, but without it, big challenges arise. As the industry matures, however, projects find themselves having to address pesky governance issues that once seemed far off. How to deal with factions who want to see different block sizes? How to address major hacks and loss of funds? How to simply make decisions with finality around the world of potential feature changes? Without a clear, articulated governance structure, crypto protocols suffer from delayed decision-making and implementation as well as contentiousness around the validity of those decisions. Today, a number of forces are increasing the broader crypto communities focus on governance, with implications not only for protocols but the developers, investors and communities that surround them. First, the efficacy of the “governance-by-default” approach of Bitcoin and Ethereum is being tested. As Bitcoin becomes a more important global settlement layer, there are questions of how decisions that determine the direction of the protocol actually get made, and by whom. As the timelines for major Ethereum milestones like sharding and the transition to Proof of Stake are repeatedly delayed, investors are losing faith in the ability of the team to execute and developers are starting to look towards other protocol alternatives. What’s more, the rosy perspective on hard forks as a useful governance mechanism has dimmed. 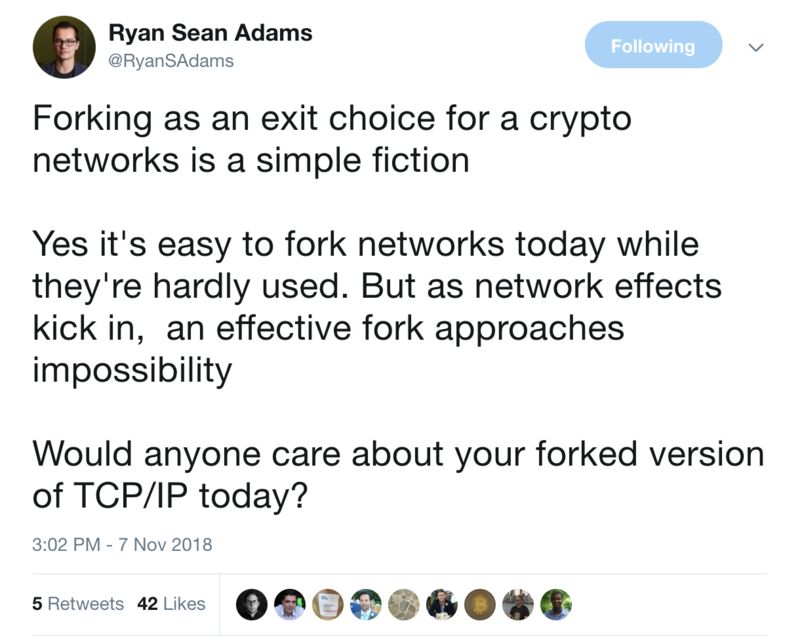 Increasingly, the industry recognizes that while, technologically speaking, forking is effortless, the cost of hard forks to the community and network surrounding a cryptoasset are immense. 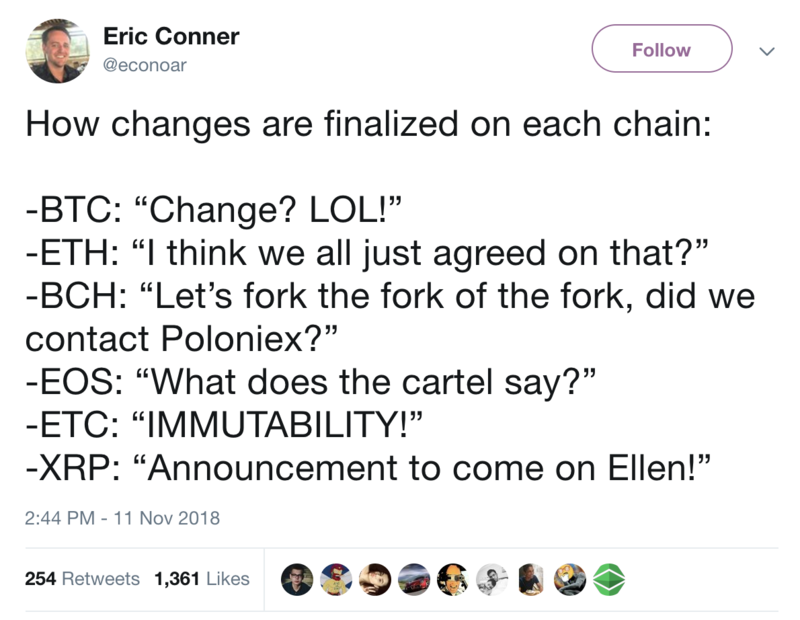 Second, a set of newly live protocols including EOS, Tezos, Dfinity and Decred are putting the governance conversation front and center by offering different versions of on-chain governance that they argue are superior to the off-chain approaches of the other protocols. If the offline process of proposal > debate > implement > fork followed by Ethereum and Bitcoin was governance-by-default, these on-chain systems are “governance-by-design.” Observers may critique these implementations as clunky, incomplete, or even showing signs of collusion and manipulation, but the fact of the matter is that they now exist, and are competing for intellectual mindshare and applied resources from developers, investors, and the community as a whole. Third and most importantly, growing institutional engagement with crypto assets means the importance of governance models is growing. Over the last few months, major financial players from TD Ameritrade to New York Stock Exchange-owner Intercontinental Exchange (ICE) to Fidelity have announced major initiatives to enter the crypto space. The clients these institutions serve are significantly more risk-averse than current crypto investors. This group of investors is likely to demand much more clarity about governance issues such as monetary policy changes or loss of funds that could have a material impact on their investment. In this, crypto markets are falling into a pattern displayed in emerging markets throughout history. At the beginning, the most risk tolerant forge into new, unexplored areas, effectively creating the markets as they go. For these markets to expand beyond those very earliest adopters, however, an injection of trust is required. Historically, this trust has come in the form of laws and contracts back-stopped by state-level governments. These protections de-risked markets sufficiently that larger enterprises could participate with confidence. In the context of blockchains (part of the promise of which is working in a global, permissionless manner), this trust and confidence will come from clear, understandable, adaptable governance systems. As the world’s largest enterprises turn their attention to crypto they are looking not only at current logistics like options for large over-the-counter buying and asset custody, but also at how to price in risk for their investments. In this case, risk isn’t just a calculation of macro market volatility, but about the internal likelihood of different change scenarios of a particular asset. Governance systems have a major deterministic impact on this calculus. As the rules engine and mechanism for change, governance provides enterprises some amount of insight into how easy or hard it is to change key aspects of a protocol. Too easy to change, and a protocol is subject to overreaction and volatility. Too hard to change and protocols calcify, unable to evolve to new market realities. This is why, to date, most major enterprises continue to sit on the sidelines. The governance systems of the leading protocols are simply not ready for the stress of massive global transaction scale. While the problems with today’s governance models are numerous, a few stand out: efficacy and finality in “1.0” off-chain governance models, and plutocracy and populism in emerging “2.0” on-chain models. The first is efficacy - in other words, the effectiveness of how decisions are made and operationalized. While there is an inevitable tradeoff between decentralization and efficiency, there is still a balance to be reached where decentralized organization structures are able to adapt, build and react efficiently to challenges as they arise. For example, at the recent Multicoin Summit, investor Fred Wilson griped about the operations of Ethereum, a protocol of which he is a huge supporter. A related problem is finality. Decentralized decision making systems can suffer from the inability to make complete decisions accepted across the community. Bitcoin has been marked by internal civil wars about blocksize and hard forks that wrench the community value network apart. While some argue that this messy business is simply the cost of doing decentralized business, the inability of the governance system to address major issues without contentious and costly forks is a major deterrent to the participation of large enterprise actors. If efficacy and finality are common concerns around the off-chain, community-style governance systems of the major Proof of Work protocols, the newer on-chain governance systems suffer from their own challenges. One of these is the way on-chain governance tends to enshrine plutocracy or rule by the rich. Systems where more token holding equals more voting power are extremely susceptible to re-centralization and power concentration. This is especially worrisome for enterprises as tokens are often concentrated in the hands of early adopters and whale investors. In the case of EOS, the 21 block producer system is already seeing stress around accusations of manipulation levied at Chinese exchange Huobi, who has purportedly been organizing a syndicate of block producers to vote for one another. On the other end of the on-chain problem spectrum is populism, where protocols make change too easy and too open-ended, leading to a situation where core developer teams are bogged down in a new form of communitarian bureaucracy. Take, for example, the Decred community voting on which PR firm’s proposal to accept. Subjecting development teams to community involvement in every basic, day-to-day decision like this is distracting at best, and in many cases could actually lead to a worse decision being made, as many categories of fundamental business expenses (like marketing and PR) are unpopular but still necessary. Additionally, what on the one hand seems like a win for transparency, for a major global enterprise could signal that the crypto protocol is susceptible to mob rule. So, if neither the off-chain “governance by default” or current crop of on-chain “governance by design” models seems capable of inspiring confidence among the next generation of prospective enterprise adopters, what is the industry to do? Is the rules engine and decision making process of governance sufficiently well-defined that the community can make decisions without having to debate how to make decisions every time a decision needs to be made? Is the decision-making process sufficiently well-defined to reach consensus with finality in a way that ensures that a majority of the community will accept a decision? Is the mechanism by which consensus is reached democratic, and resistant to the tendencies for blockchain governance systems to devolve into plutocracies? In other words, is power balanced such that no one stakeholder (miners, validators, etc) can aggregate too much influence and control? Is change possible but sufficiently difficult to avoid the vagaries of populism? The governance conversation is going to get louder and louder as new, would-be market participants exert pressure on protocols to better define change processes. What’s more, these new participants won’t just be increasing pressure, but increasing the total economic value flowing through the system. Already, the stakes of governance decisions can be millions or even billions of dollars. We see this plainly in contentious forks, such as Ethereum and Ethereum Classic’s split in the wake of the DAO hack and in the messy, ugly civil war enveloping Bitcoin Cash right now. When the full economic power of Wall Street and the legacy financial markets are brought to bear in the crypto ecosystem, these sort of battles will seem like nothing but skirmishes. Blockchains are records of property rights. History has shown us that when property rights go ungoverned, it leads to chaos and eventually war. Without strong governance systems, blockchain based systems could devolve incredibly quickly. On the other hand, the laws surrounding property rights are also at the heart of well functioning democracies. For this reason, the growing focus on governance in the broader crypto conversation will inevitably make the market better. Just as historical markets flourished when laws and contracts made them viable for a broader array of actors, better governance systems will open the door to new capital and enterprise business flows that will lift crypto to the next level. TD Note: Storecoin is sponsoring the Token Daily Newsletter this month. This blogpost is not part of that sponsorship agreement. Token Daily's blog is not open to sponsorship. Inventing @Storecoin #. Member @wef. Thinking @Data4America. Curating @Cryptow1re. Created @YourSports. Optimist. Investor. Husband. Dad of twins. Cryptogeek.